Successfully Added Android 5.1 Smart TV Box - 4K Support, H.264 Encoding, Quad Core 64-bits Cortex-A53, Kodi 15.1 to your Shopping Cart. Let your TV be all that it can be and offer you lots of entertainment options with the Android 5.1 smart TV box. It comes with 4K support, H.264 encoding, powerful quad core CPU and more. Get a better home entertainment system with a small, yet powerful gadget. The smart TV box comes with lots to offer. You will have 4K – ultra high definition support – meaning that all your shows and movies can be displayed in amazing quality. The powerful quad core processor and strong graphics will back up all the fun plans you have for your TV box: movies, apps and games will all run smoothly and with no lagging. The TV box comes with 8GB of internal memory and can support up to 32GB externally. Moreover, thanks to H.264 encoding, the TV box will be able to store your content without it taking up too much space – yet, while preserving great quality. You will have Android 5.1 for quick navigation and access to the Play Store for extra fun. 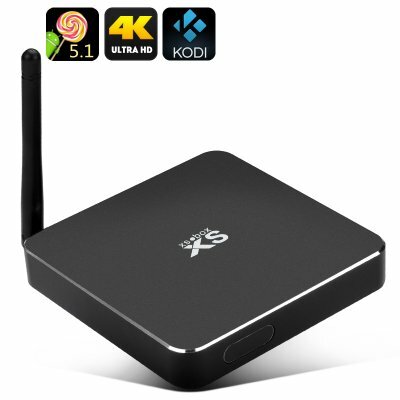 The 4K TV box already comes with pre-installed Kodi 15.1 – so, you will also have access to lots of great free content. The TV box also comes with DLNA, Miracast and Airplay support as well as great external connectivity: HDMI, SPDIF, two USB slots, micro SD card and more. The Android 5.1 Smart TV Box comes with a 12 months warranty, brought to you by the leader in electronic devices as well as wholesale Android TV boxes..